Preheat your Yoder Smokers YS640 to 225ºF. Pull the skin all the way back from the meat, but leave it attached at the end. Season the meat well with the rubs. Pull the skin back in place over the meat. 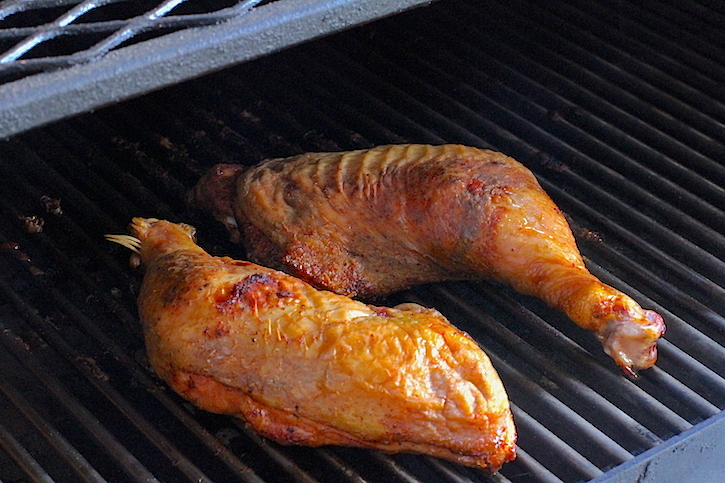 Smoke until an instant read thermometer inserted in the thickest part of the thigh reads 165ºF. Remove from cooker. Remove and discard the skin. Pull the meat from the bones and shred the meat either by hand or with forks. Toss the pulled chicken in BBQ sauce. Build the sandwiches. 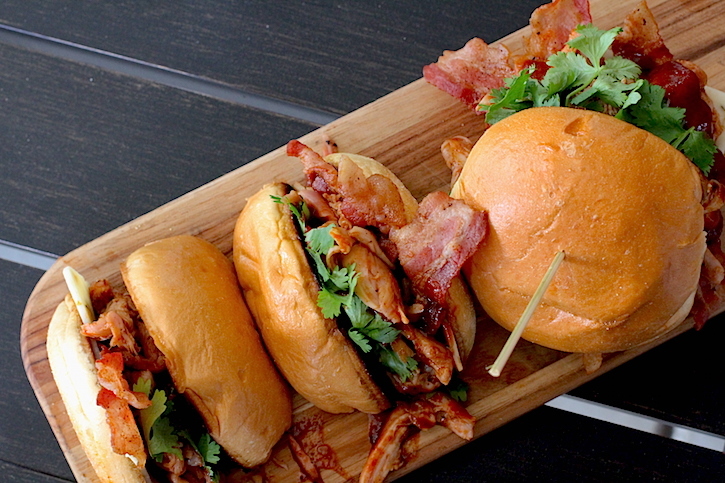 Bun, slice of cheese, bacon, chicken, more BBQ sauce, cilantro, bun. EAT! 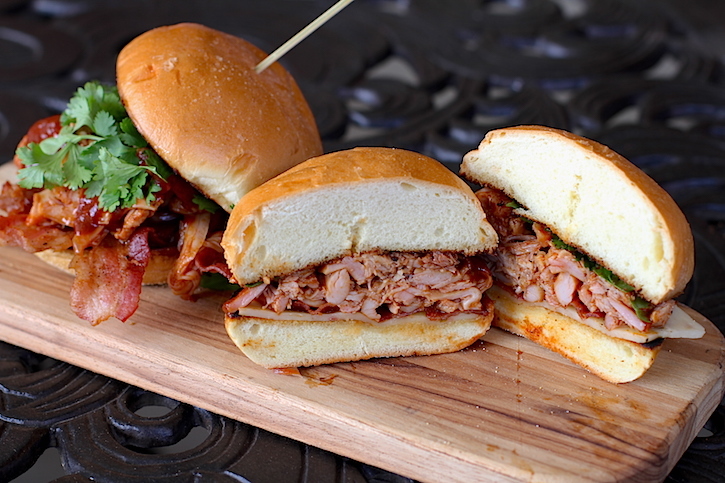 The classic BBQ chicken sandwich, with a few of our own touches. Cilantro is a great aromatic complement and gives great color to the sandwich. The pepper jack adds a touch of creamy heat, and bacon is bacon, so… BACON! 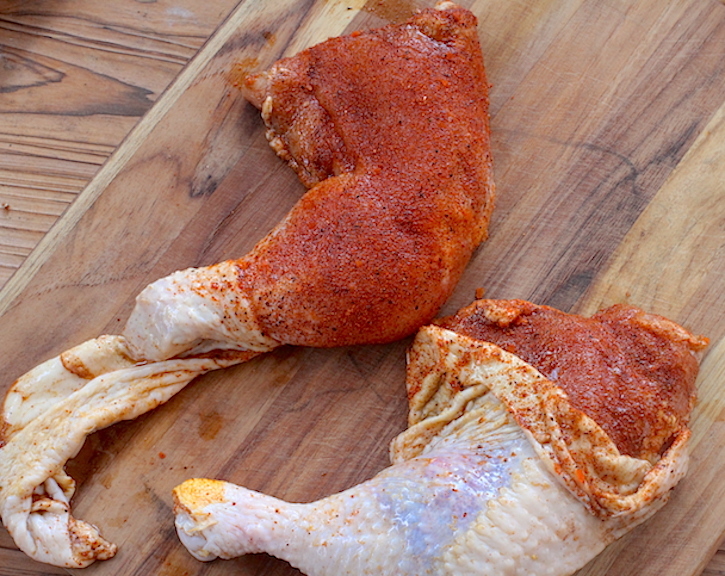 We’re smoking quarters for this recipe because they shred really well, retain their moisture well, and it’s easier to control the amount of cooked chicken that you end up with (as opposed to cooking a whole bird). Pulling the skin back allows the rub to penetrate the meat. Putting the skin back in place for the cook protects the meat from radiant heat, allows the meat to retain moisture and allows the rendered skin fat to baste the meat while it cooks.